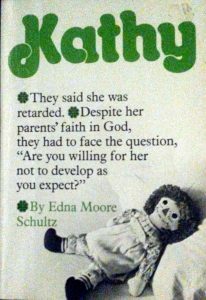 “A retarded child.” What mental distress,what heartache is associated with this phrase! Yet thousands of children, handicapped by pathetic mental limitations, are part of American homes, bringing “bane and blessing,pain and pleasure,” to fathers and mothers, brothers and sisters. Newborn Kathy was a lovely baby in the eyes of her parents, but the restrained attitude of her doctor and the sadness in the eyes of her nurse, these made the parents wonder if something was wrong. And something was wrong. Kathy was a Mongoloid. Kathy’s mother tells the story – the eager anticipation as they awaited the coming of the child; the appalling shock when they learned the truth; their instinctive turning to Almighty God in faith.